Well…since it is Thursday it is time for another challenge over at Create with Connie and Mary. We have a unique color challenge for you…Sahara Sand, Soft Sky and Rose Red. I will admit…this one was a CHALLENGE!!! But I do like the card I ended up with. Something Borrowed dsp – 3 3/8 x 3 3/8, layer onto Whisper White 3 1/2 x 3 1/2 and add to card front. Soft Sky and Soft Sky dsp banners – 1 1/4 x 3 1/2. Stamp plain one with greeting using Rose Red. Sponge around edges using Soft Sky. Layer, add to card front, trim edge. Bottom flower – Rose Red using Bouquet Die, Rose Red dotted (Painted Blossom dsp) Pansy punch – they layers soooo wonderfully! Add to card front. Add large Silver Basic Metal Button to center of flower, tie bow using Painted Blooms Cotton Twine, add to center of button. Punch Rose Red mini flowers using Itty Bitty Accents punch. Add to card front. Add Basic Rhinestone to center of each and on card front to finish it off. And don’t forget to head over to Create with Connie and Mary to check out what the design team did with this delightful challenge! This entry was posted in Create with Connie and Mary, Spring Mini and tagged And Many More. Bookmark the permalink. Beautiful!! I’m CASEing this one for sure. You have such a gift. TFS!!! I love that layered flower and the use of the spot DSP, with the blue banner behind – great way to use this week’s colours! These patterns are so pretty together, and I love your angled banners with the greeting peeking out! Great card! At first glance the paper looks like it has raindrops on it – way better than snow! Anything is better than snow! Beautiful Spring card, Mary. Wow, what a happy card! 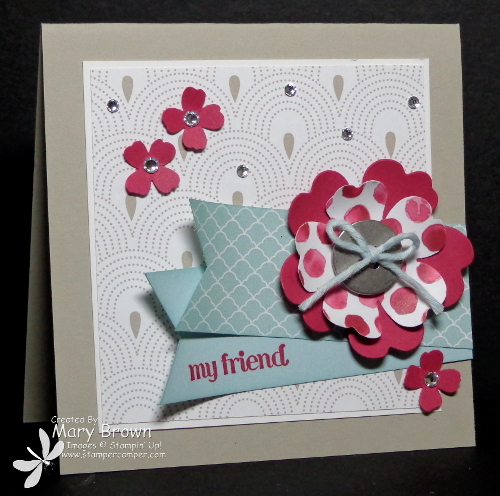 I love your curled up flower with the silver button center! Lovely! What a sweet card! I love that DSP and am sorry I haven’t gotten it.. it is such a great background for your pretty flowers and banner!